It has been a while since we have seen budget smartphones from Samsung, which are aggressive in all aspects. Probably why their position was disturbed in the Indian market. However, 2019 is telling a different story for them and in the very first month the Korean major has gone ahead and launched two new smartphones, which cater to the younger generation. 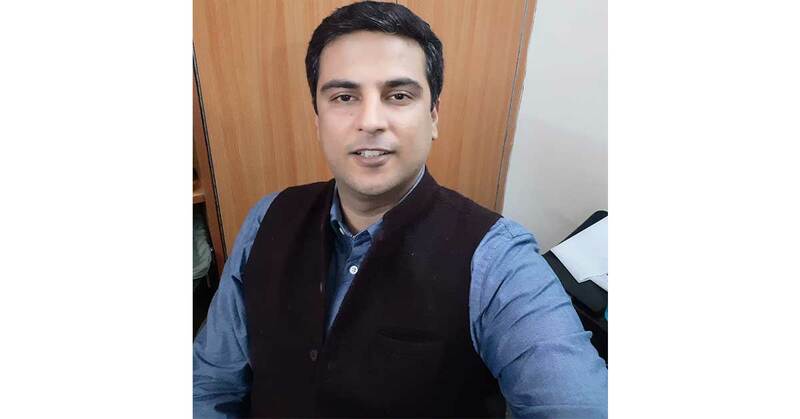 Called the Samsung Galaxy M10, whose review can be read here, and the Samsung Galaxy M20, these smartphones are built by the company in India, for India, to regain lost ground. They are not only priced aggressively, but they also bring with them a set of good to great specifications. Over that, you do get that Samsung branding that says a lot. Don’t forget the good service Samsung has throughout India, which makes up for a great after sales. This is a good mix for any consumer who wants to pick up a smartphone that can easily last them for 1.5-2 years or more. 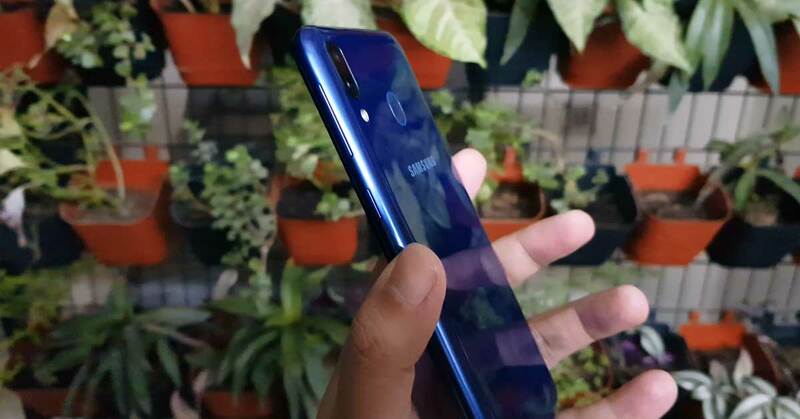 We played around with the Samsung Galaxy M20 for a little while to understand if this smartphone will strike the right cords with the millennials in India? Read the rest of our review to find out. First step, the design of the smartphone. If you have not seen the unboxing video of the Samsung Galaxy M20, then no problems, let us take you through the design of the smartphone first. As soon as you take the smartphone out of the box, it screams look at my beautiful 6.3-inch display. Samsung has some of the best displays in the business and they have incorporated another great one on this mobile device. More on it in the second half of this section. The build quality is very Samsung. 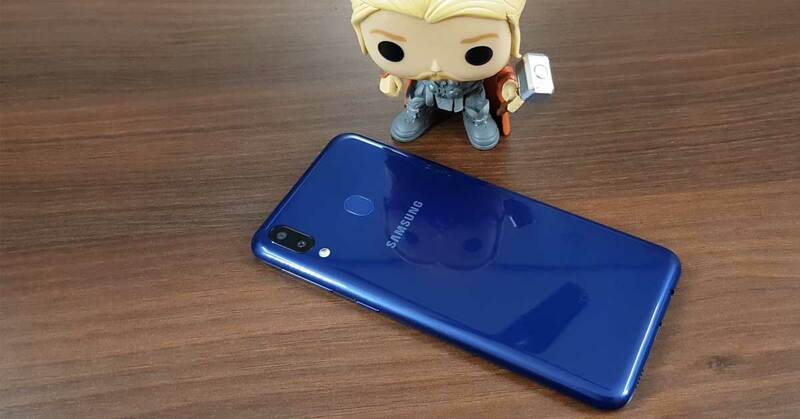 Dressed in Blue this smartphone comes with a Waterdrop Notch design, the first to be seen on any Samsung Smartphone. The Samsung Galaxy M20 is an India first innovation, so things have been designed on the smartphone keeping the youth of India in mind. Which is why you will see the price on the lower end of the spectrum too. 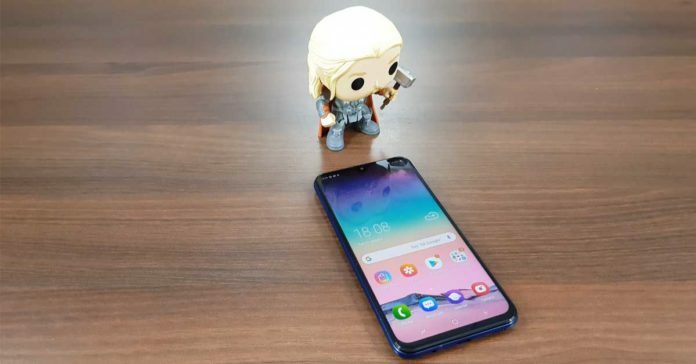 Since the camera is placed in the waterdrop notch, the ear speaker grille has been pushed upwards to the top edge of the device. The screen is almost edge to edge and with minimal chin area. The display is a bit raised and comes out of its shell, which is a given, as it has a super large 5,000 mAh battery inside. All this is packed in decent looking plastic shell, which has the volume rocker and power buttons on the right side. The dual SIM tray is placed on the left, which can also accommodate a micro SD card with 2 NANO SIMS at the same time. 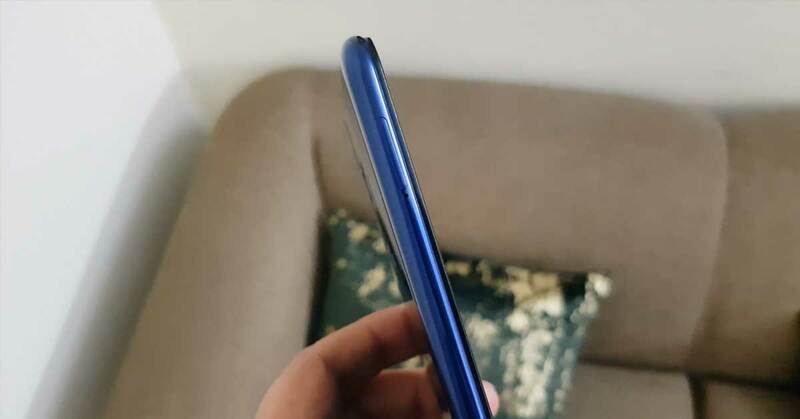 The bottom part of the Samsung Galaxy M20 has the speaker grille, USB Type-C charging ports and 3.5mm audio jack. The top head of the device has the second pinhole microphone. At the rear, Samsung has placed a large fingerprint reader, vertically stacked dual cameras with flash and the Samsung branding. Yes, the rear does attract its fair bit of smudges, but most in the category do that. If you look closely at the bottom part of the rear panel, you will get see the made in India branding there. Moving over to the display of the Samsung Galaxy M20. We must say it left us awestruck. It is a great display to own in this price bracket. We loved every bit of it. The 6.3-inch FHD+ Infinity V display not only looks good, but has the best moving imagery to show. With 409PPi and aspect ratio of 19.5:9, this smartphone is built with an aim to provide great movie and game experience to its users. And we played a lot of it on this smartphone. YouTube videos and downloaded movies look exceptional on it. The games look vibrant and there is minimal ghosting. Sunlight legibility is also nice and one can easily read text and Whatsapp messages under direct sunlight. In a nutshell, the screen of Samsung Galaxy M20 does perfect justice to all the facets one wants from a display in a Smartphone. Namely videos, imagery, daylight readability and gaming. Now let’s talk about its under the hood performance. The Samsung Galaxy M20 comes with an Exynos 7904 chipset, which has 1.8GHz dual core plus 1.6GHz Hexa-core CPUs (Cortex A73 + A63). This is partnered with 4GB of RAM and 64GB of internal storage (the one we are testing). There is one more version available that has 3GB RAM and 32GB storage. The storage is expandable using a microSD card up to 512GB. The graphics are powered by Mali-G71 GPU. As said before the Samsung Galaxy M20 comes with a huge 5,000 mAh battery inside which on our tests kept it alive for two days. This included a lot of gaming, watching YouTube videos, a lot of phone calls over 4G network with GPS and Wi-Fi on at all times. If that was not enough stress for this smartphone we kept the Bluetooth on too, for couple of hours in the car, synced with the car stereo. The Samsung Galaxy M20 kept doing what is does best, performing. We threw everything at it including the kitchen sink and it came out with flying colours. It can handle games pretty well too. We played PUBG as well as Asphalt 9 on it and the gaming performance was top notch. It did get slightly warm at times, but quickly cooled down as soon as we switched off the game. The touchscreen combined with Android Oreo (Android 9 update will come in a few months’ time), is a treat to work with. The Samsung Galaxy M20 responds well to every tap and swipe. Samsung has given a separate app drawer in the system, which is a good thing. The bloatware on the OS is minimal and some of it can be removed easily. The fingerprint scanner at the back works really well and the screen opens up before you can say Galaxy. Over that, the smartphone has Face unlock feature as well, which when tested did a good job. Coming to the sound of the device, the single speaker we felt was slightly under powered. However, we were mostly on our trusted headphones so it didn’t matter much to us. But to some it might be a bit tricky, since a pair of headphones do not come in the box. Dolby Atmos is supported on the Samsung Galaxy M20 and it does enhance the sound to quite an extent when using a headphone. 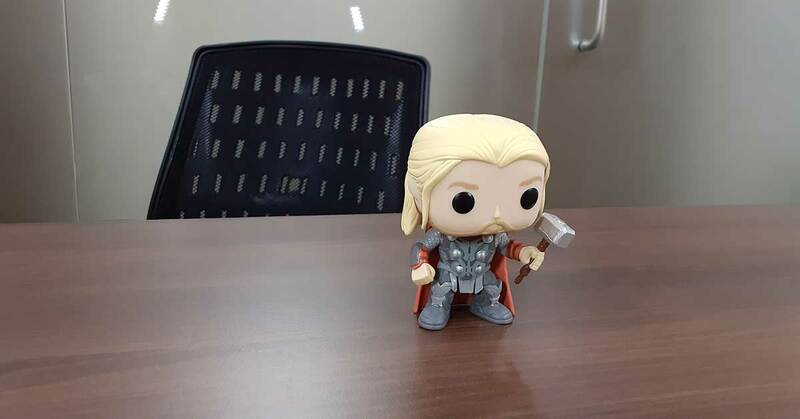 The voice quality of the Samsung Galaxy M20 is pretty nice, too. We used it while travelling and, on most occasions, we were able to hear the other side clearly. They too were able to hear us clearly, barring few sectors where Vodafone does not work properly. Quick charge function is also there in this smartphone, but we rarely required it since the battery is so big. 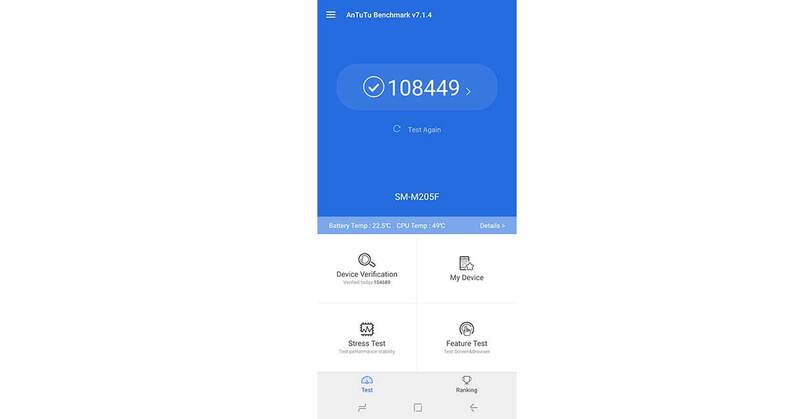 On the benchmarks the Samsung Galaxy M20 scored 1,08,449 points on AnTuTu. On Geekbench it scored 1321 points on single-core and 4,153 points on multi-core CPU test. It also scored 3,762 marks when it came to Geekbench’s computing test. Coming to the cameras. The Samsung Galaxy M20 sports a dual rear camera setup comprising of a 13-megapixel primary sensor with an aperture size of 1.9 and secondary ultrawide sensor of 5-megapixel. They are quite a duo. We were able to squeeze out some exceptional shots during the day time and also in low light. At night we used the flash and it brought back good details to the images. There are lot of imaging modes available in the Samsung Galaxy M20. These include Beauty, Panorama and our favourite the pro mode. This gave us a lot of power over our shots. The images come out to be vibrant with good sharpness. The videos too come out great, however 4K videos cannot be shot with this smartphone. The selfie camera is also great for taking snaps. The front camera has been placed in dead center of the top of the mobile and it can take lovely snaps during the day. At night if you want better clarity from the snaps, then our suggestion is to keep the screen flash on. This projects a bit of light on your face and the camera can grasp more of the object in front of it. Smart stickers mode is also available on both the cameras, which add fun stickers to your images. Something the younger snapchat using generation would love. At a price of just Rs 12,990 for the 4GB version, Samsung has outdone themselves. We have said this before and we will say it again, this is the comeback smartphone for them. We have seen its competition jittering already and scrambling for cover. As this is the phone that will bring Samsung back in to the game. If you want a smartphone with great performance, display, has an exceptional battery life and superb rear cameras, go for Samsung Galaxy M20 in a blink of an eye.